Vinegar is such a versatile and awesome product. I always have it in my house. I buy this one and use it very often. I like using vinegar as a natural alternative to soaps and cleaners. Check out some of the awesome ways to use white vinegar below! Mix half and half with water in a spray bottle, spray windows and wipe down with a microfiber cloth. Fill a downy ball and put in your wash. OR do an extra rinse with 1 cup vinegar. It's a natural fabric softener. After chopping an onion, rub some white vinegar on your hands to get rid of the smell. When cooking cabbage vegetables (broccoli, cauliflower, etc) add a little vinegar to the water to enhance flavor and reduce the gassiness they produce. Dump 1 cup of Baking Soda in a drain and follow with 1 cup vinegar. Watch the fizz do it's job! Got scuffed or dirty DVD's? Wipe down with a soft cloth dipped in vinegar. They look brand new. Vinegar will loosen gum on upholstery, carpet and clothes. Pour vinegar (or spray) onto weeds and it kills them. Add some vinegar to a vase and extend the life of fresh cut flowers. Spray vinegar on furniture or carpet where cats are scratching. They hate vinegar. Pen Marks especially on walls. Dab a sponge dipped in vinegar on the marks, do this over and over until it's gone. But it does work. Did you recently burn food? Or even cigarette smoke. Leave a bowl of vinegar in the room (or in a few rooms) and the smell should be gone in less than a day. Spray vinegar full strength and then buff with a soft cloth. Back to new! Use equal parts vinegar and water in a bowl, use a cloth and clean inside and outside your fridge. This helps neutralize and get rid of any odors. 2 cups of vinegar to 1 cup of water and brew it through your machine (if doing single serve, brew until the solution is all gone). Then repeat the process with just water to rinse the vinegar out. Are your blades dirty and streaky? Use a cloth dipped in full strength vinegar and wipe the blade down. It should work as good as new. Shine them up with 1/2 cup vinegar in 1 gallon warm water. Use a soft cloth to wipe them down. Did you know you're supposed to do this? Pour in 3 cps vinegar and 1 cup baking soda. Run a full cycle without any clothes or detergent. You can also let it fill up and soak and then run a cycle. When it's done use damp paper towel to wipe out the grime. Soak tools in full strength vinegar for a couple days and then rinse them off. Paintbrushes have dried paint on them? Soak them in vinegar until the paint resolves and the bristles are soft, then wash in hot soapy water. Just painted a room? Leave a couple bowls of full strength vinegar in the room to quickly get rid of the smell. Somebody went potty on the carpet? Blot up as much of the mess as possible, then spray undiluted vinegar on it, blot it up again, re spray and let it dry. The smell should be gone when the vinegar dries. Playpen been through a couple kids and smell stinky? Spray it liberally and let air dry. Got any Vinegar Tips? What do you use it for? I'm going to have to save this list for spring cleaning! I love these articles about how to use basic household items for many purposes. I enjoyed the one on coconut oil also. These are great tips. I've used vinegar as a cleaner but never knew about it as window cleaner, pet stain smells, and getting rid of weeds. 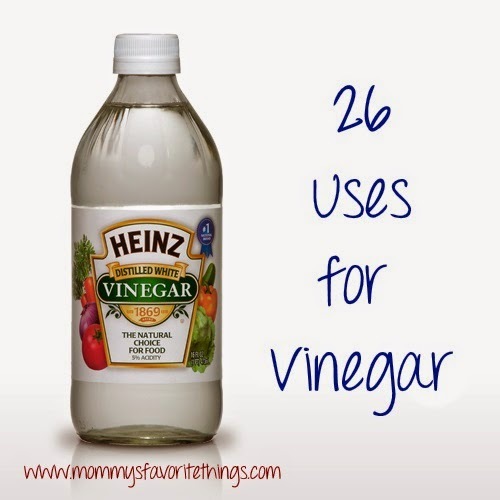 Wow, we use vinegar for a lot of different cleaning, but this is an even more extensive list. The other thing I use vinegar for is to scrub hard water scum off the shower walls. I use 1:2 ratio of dish soap to vinegar and spray it on the walls, let it sit for 5 minutes and then scrub the scum off. We use vinegar for everything in my house. I had no idea though that it will extend the life of my flowers! It is crazy how much this stuff can be used for. It is awesome! I had no idea that there were so many uses for vinegar. I really like these. I would prefer using something natural vs. a chemical. Vinegar is one of the most GMO items out there so just be careful what type you are buying! It can also damage wood floors so you might want to avoid there. Wow! I didn't know vinegar had this many uses. Very neat! Cleaning drains is a favorite of mine. Great list. Vinegar has always been one of my favorite cleaning tools. Thank you for the list of ways to use vinegar! Great tips to keep my house clean . I do hate the smell of onions on my hands after i cut them will give this a try next time i cut some up for making dinner. I pinned the list to be able to have it. I didn't know half of these uses for Vinegar. Thanks for sharing. Yes, vinegar has so many uses! I did not know about using it to remove onion smell on hands. It is amazing all the things you can do with vinegar. I have heard so much about apple cider vinegar being healthy to eat. I have used vinegar to clean many of these things. When I had my new floor installed the installer recommended that I use vinegar to clean it.